The classicism of the building's exterior is accentuated by the carvings and bronze work created by Lee Lawrie (1877-1963), a sculptor Goodhue had worked with previously.9 Lawrie's earlier architectural commissions were notable for the way in which the sculptures form an integral part of the building rather than simply a decorative overlay, and he achieved this throughout the interior and exterior of the NAS Building through sculpted compositions based on the history, lore, and role of science. 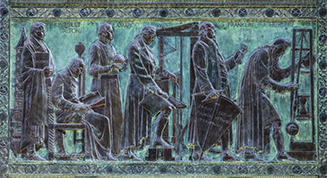 The stone carvings on the entry portal facing Constitution Avenue are typical of Lawrie's work. 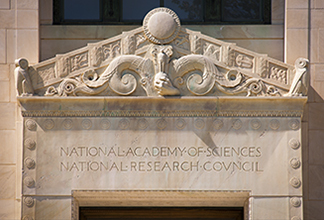 The false pediment above the door depicts an allegory of the evolution of life with a stylized sun, reminiscent of the Egyptian solar disk, at the apex and a series of carvings representing earth, sky, water and plant and animal life, including, just beneath the sun, a hand grasping a human figure. This tableau is framed at each end by a carved owl, symbol of wisdom and the emblem of classical Athens. The roof is capped with a copper crest, or cheneau, composed of alternating figures of owls and lynxes, symbolizing wisdom and alert observation, respectively. At each corner, Lawrie sculpted a coiled snake, another ancient symbol of wisdom. Marble cornice of the Constitution Avenue entrance by Lee Lawrie. Snake, lynx, and owl motifs of the copper cheneau by Lee Lawrie. 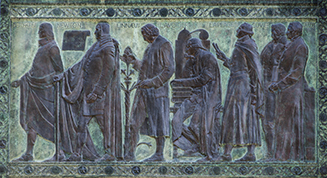 The doors themselves, made of cast bronze plates overlaid on wooden cores, are divided into eight panels each of which portrays a major figure in the history of science. 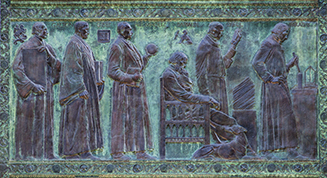 From top to bottom and left to right when viewed facing the building, the panels depict Aristotle; Euclid; Galileo; Newton; Lyell; Darwin; Watt; and Pasteur. 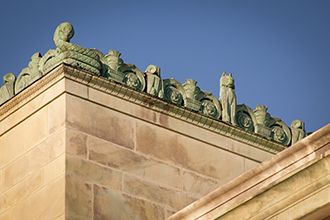 The six double-height windows along the Constitution Avenue façade are separated into first- and second-story sections by six large panels, three to the west of the main entrance and three to the east. 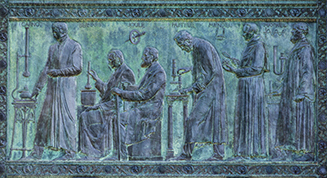 Each panel, Lawrie's work in bronze bas relief, depicts six (or in the case of the fifth panel, seven) pivotal figures in the history of science accompanied by the objects symbolizing their contributions to science. 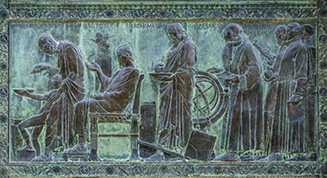 From west to east, the scientists depicted are: Galton, Gibbs, Helmholtz, Darwin, Lyell, and Faraday (Panel 1); Humboldt, Dalton, Lamarck, Watt, Franklin, and Huygens (Panel 2); Galileo, Leonardo, Hipparchus, Euclid, Democritus, and Thales (Panel 3); Hippocrates, Aristotle, Archimedes, Copernicus, Vesalius, and Harvey (Panel 4); Descartes, Newton, Linneaus, Lavoisier, Laplace, Cuvier, and Gauss (Panel 5); Carnot, Bernard, Joule, Pasteur, Mendel and Maxwell (Panel 6). The panels are arranged in two roughly chronological sequences radiating outward from the main entrance. Thus Panels 1-3 trace a chronology running from Galton (1822-1911 and at the outer west end) through Thales (641?-546 B.C.E. ), while Panels 4-6 trace a chronology from Hippocrates (460?-377? B.C.E.) to Maxwell (1831-1879). From left to right: Galton, Gibbs, Helmholtz, Darwin, Lyell, Faraday. From left to right: Hippocrates, Aristotle, Archimedes, Copernicus, Vesalius, Harvey. © 2012 Maxwell MacKenzie. From left to right: Humboldt, Dalton, Lamarck, Watt, Franklin, Huygens. From left to right: Descartes, Newton, Linnaeus, Lavoisier, Laplace, Cuvier, Gauss. © 2012 Maxwell MacKenzie. 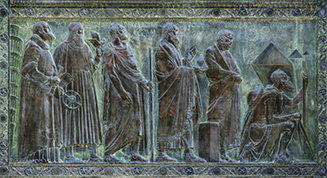 From left to right: Galileo, Leonardo, Hipparchus, Euclid, Democritus, Thales. © 2012 Maxwell MacKenzie. From left to right: Carnot, Bernard, Joule, Pasteur, Mendel, Maxwell.